One in 13 kids have a food allergy. By placing a teal pumpkin on the doorstep and offering non-food treats, community members can help make Oct. 31 safe and fun for all trick-or-treaters this Halloween. Halloween can feel more like a trick than a treat to kids with allergies. With Oct. 31 just around the corner, most youngsters are ramping up for the costumed sugar-fest by prepping their princess or superhero getups and pulling out their pillowcases to be filled with candy. But children with allergies are often excluded from the most highly anticipated part of the holiday: trick-or-treating. This year, however, Food Allergy Research and Education (FARE) is working to make the tradition every bit as exciting for these kids by launching the nationwide Teal Pumpkin Project. “FARE is encouraging families to paint a pumpkin teal and place it… in front of their house to indicate they will have non-food treats available on Halloween,” according to a press release from FARE. Teal is the color of food allergy awareness, according to the organization. FARE encourages people to hand out inexpensive, non-food treats and toys such as glow bracelets, stickers, pencils and bouncy balls. Local parent Camie Slaight is hoping the project will catch on in Craig. “My 3-year-old was diagnosed with a life threatening peanut allergy at age 1. Most people don’t realize that most candy has been processed with peanuts or has peanuts in it, and he can’t have any of it,” Slaight said. Other common allergens include different types of nuts, milk, wheat and soy — ingredients found in many candies. And FARE is trying to warn parents of the real trick when it comes to Halloween candy. Slaight explained that for her son, even safe, peanut-free candy can become dangerous to him if it comes into contact with peanut-containing candies, despite being individually wrapped. He’ll also have a reaction if peanut touches his skin. Food allergies affect one in 13 kids in the U.S. and 15 million Americans overall, according to FARE. That means roughly two kids in every classroom have some kind of food allergy, which can range from mild to severe — as in the case of Slaight’s son. 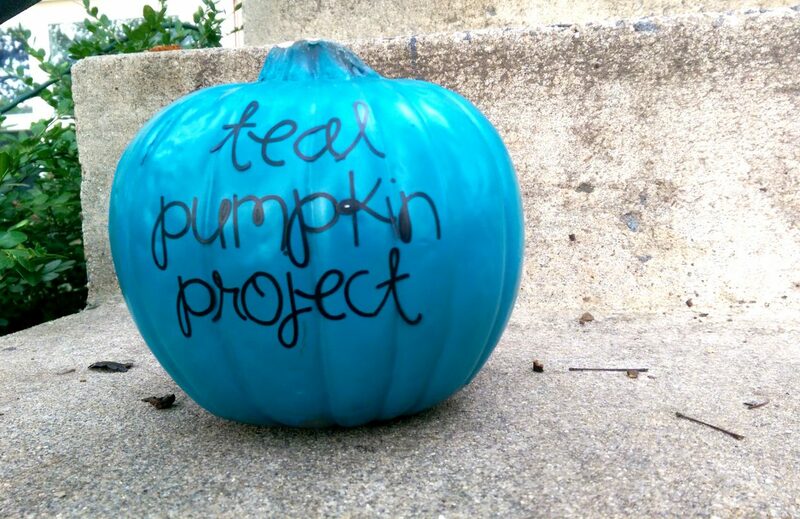 The Teal Pumpkin Project is gaining popularity nationwide, having reached approximately 5.2 million people via initial Facebook posts from FARE, with over 52,000 shares. For children like Slaight’s son, Lucas, the project holds the promise of making Halloween more inclusive for him and other kids with food allergies. With a father who works for the Craig Rural Fire Protection District, Lucas plans to be a firefighter for Halloween this year, and already has his guise ready. “I had to hide his Halloween costume because every time I turn around he’s wearing it,” Slaight said. And, with the possible boon of a few teal pumpkins promising allergy-free goodies in the neighborhood, this year’s Halloween could be a lot more fun for one little Craig firefighter.